What is the big deal about the River Market? Why do they call that area the River Market District? It's because the area has become the booming place to do just about everything in Little Rock. Head downtown to see the best of Little Rock for tourists, families, foodies, and people who just want to have a good time. I've included some hot spots outside of the River Market, but you really don't need to stray far to see the best of Little Rock. 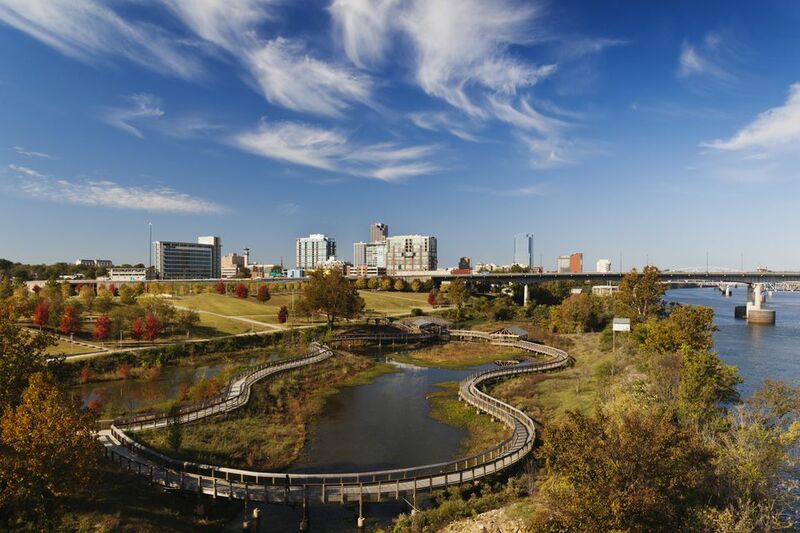 Some of the most famous can't miss things to do in Little Rock are in the River Market area. The Old State House (the current Capitol Building is downtown too), Clinton Presidential Library and Heifer International call this area home. If you're into local history, the Historic Arkansas Museum is located here as well. You can even stroll through Riverfront Park to La Petit Roche Plaza and see the little rock Little Rock is named after. Downtown also hosts the Arkansas Arts Center and the MacArthur Museum of Military History. Whatever kind of food you like, you'll find it downtown. The biggest farmer's market in Little Rock is located in the River Market pavilion. The downtown area has some of the best fine dining in the city with One Eleven at the Capitol. Forty-Two in the Clinton Library also receives rave reviews. There's 4square for vegans, Dave's Place for lunch, and The Flying Fish, Dizzy's, and Hanaroo for dinner, just to name a few. Don't let all the nightlife fool you, during the daytime, downtown Little Rock is very family friendly. You can visit the Witt Stephens Nature Center and the Arkansas Museum of Discovery and Heifer International's Global Village. All of these are kid-friendly. There are even a few kid-friendly restaurants. Iriana's Pizza is pretty delicious and Cotham's has great burgers. Downtown Little Rock is the most popular entry on point to the Arkansas River Trail. You can walk, bike or skate a 14-mile loop starting at the Junction Bridge in Riverfront Park. You can also take a less intense stroll down the Medical Mile or just do part of the trail. Riverfront Park is also the home to the innovative Peabody Park, a fun natural park for kids. Verizon Arena is right over the bridge, but downtown Little Rock has it's own live entertainment too. Locals love Juanita's Cantina Ballroom (614 President Clinton Ave). Vino's has live music and brew. It's also a longtime local favorite. Ernie Biggs (307 President Clinton Ave) and Willie D's (322 President Clinton Ave) Dueling Piano Bars are always fun. Sticky Fingerz Rock 'n Roll Chicken Shack (107 S. Commerce St) has become well known for its live music offerings. The Flying Saucer (323 President Clinton Ave) is also in the area and has over 100 beers on tap. Revolution (300 President Clinton Ave) is a fun club with live music on the weekends. If you love craft brews, downtown Little Rock is the perfect place for you. Little Rock has a variety of craft brewed beer, and a lot of them can be found in the River Market. Try Vino's, Boscos and the Flying Saucer. Downtown is also the best place in Little Rock to spend a late, late night. Midtown Billiards is open until 5 a.m. and they serve one of the best burgers in town. The River Market District has a few fun shops in it aside from the River Market Hall itself. The hall hosts a weekly farmer's market in the warmer months, and many local artisans also sell goods there. Some favorite River Market Shops are Shop the Rock which sells Little Rock Souvenirs, Ten Thousand Villages, and Shop@Heifer which both sell articles made in villages around the world, Bath Junkie for customized bath salts and 4 Square Gifts for unique Arkansas food items. The downtown area has some of the best local hotels including the Mariott and the Capitol Hotel. It also hosts some of the best conference and meeting locations in the city. The downtown area has many historic sites including the Old State House, the oldest surviving state capitol building west of the Mississippi River. The visitor's center is located in historic Curran Hall, built in the 1800s. The historic Quapaw Quarter, a nine-square-mile area, is also located downtown and includes the Governor's Mansion and the Villa Marre, an 1881 Victorian home that was featured on the TV show "Designing Women." Historic Central High is downtown as well. Some fun tours of the area include a Bill Clinton tour, a Clinton scandal sites tour and a walking tour of downtown Little Rock. Parking can be tough downtown, but you can park on the streets at meters or in designated parking areas. For public transportation, downtown has the River Rail trolley system. Little Rock has three replica vintage trolleys operating on the 2.5-mile route. The River Rail goes all over Little Rock's River Market District and downtown North Little Rock's Argenta District. The River Rail route includes Verizon Arena, the Statehouse Convention Center, the River Market itself, both state houses, the historic Argenta neighborhood, numerous restaurants and hotels, the Historic Arkansas Museum, the Museum of Discovery, the main branch of the Central Arkansas Library System, two Chambers of Commerce, courthouses, the Robinson Auditorium Concert Hall, the Riverfront Amphitheater and more. See their website for timetables and fare information. Hotels that can be reached on the River Rail include the DoubleTree Hotel, the Capital Hotel and the Courtyard By Marriott.